Description: This viola started life as a 15″ four string Cremona Viola. It was converted to five strings in my shop. It comes as an outfit with case and bow. Description: This 15″ five string viola was made, to my specifications, in China. Ebony fingerboard, Rosewood fittings. 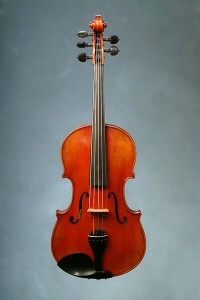 Description: This 15″ five string viola was made, to my specifications, in China. Ebony fingerboard, Ebony fittings.